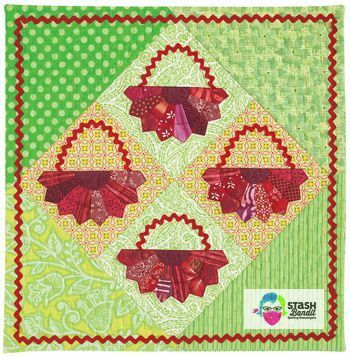 I’ve been working on a new holiday quilt called Christmas Figs. It’s been so much fun! 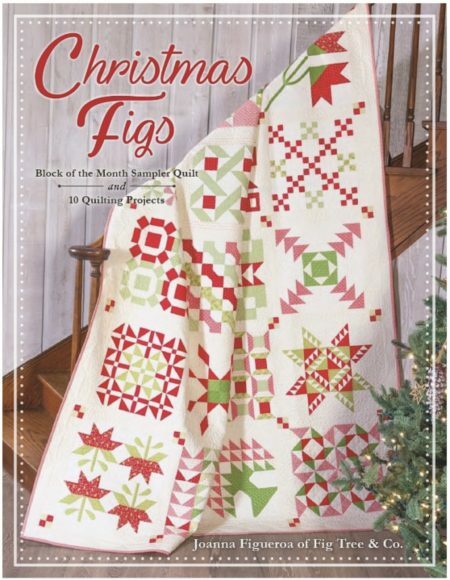 The folks at Fat Quarter Shop sent me a review copy of the Christmas Figs book, and I could not wait to dive in. 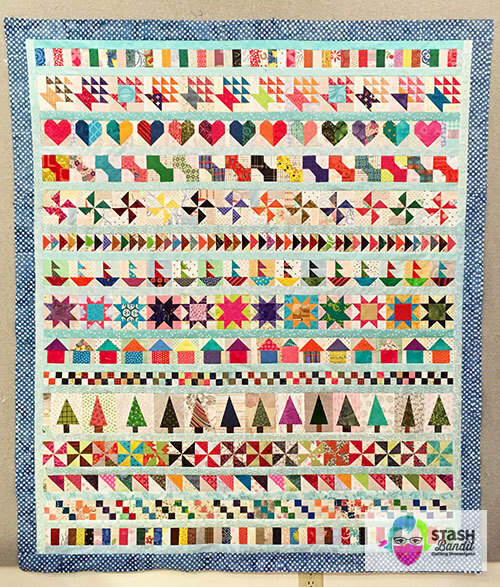 My trunk show “One Hundred Small Quilts” is popular with quilt groups. I’ve been giving it for six years and have added to the collection. I actually bring about 120 quilts with me. 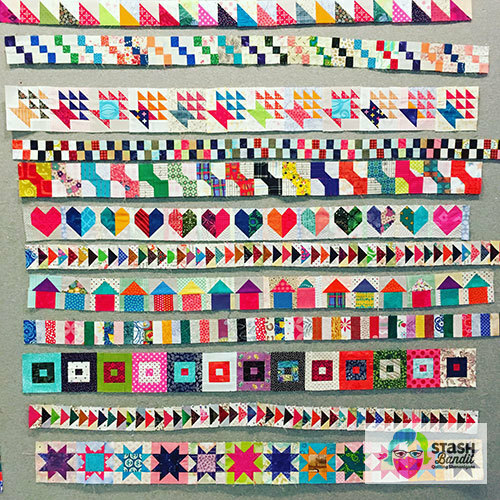 The quilts have lessons to teach us. This is Dresden Delight. Whenever I finish a quilt, I put the leftover binding into a shoebox in my closet. 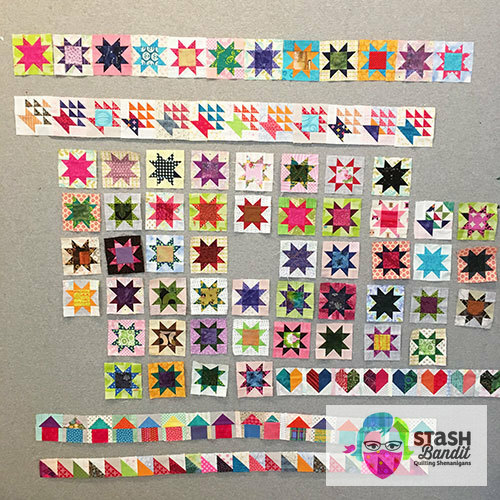 When I’m ready to bind a scrap quilt, I start by checking in the shoebox. 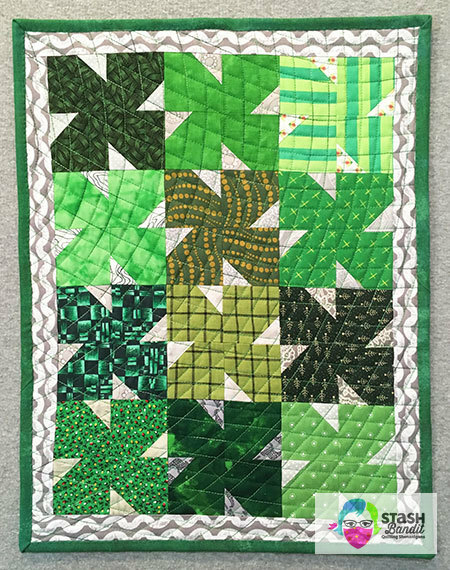 Last weekend I wanted to bind my scrappy green and teal Patchwork Forest quilt, which I’ve named Can’t See the Forest for the Trees. 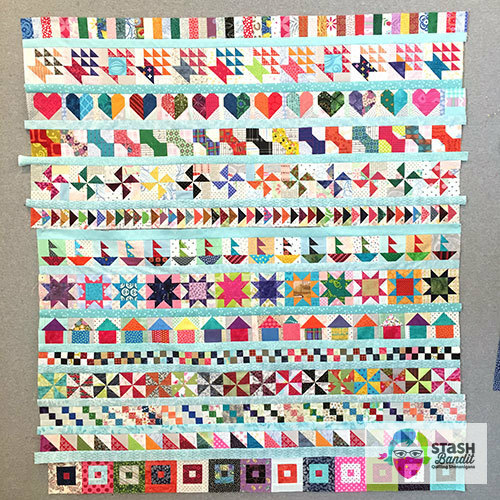 I finished piecing my row quilt from Quiltmaker’s Bitty Blocks this week. 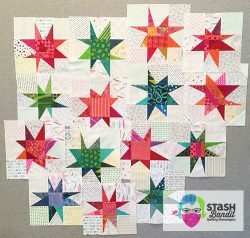 We offered these small blocks as freebies when I was working for QM, and even though I made lots of blocks at that time, I had never finished my quilt. When I pulled out this UFO to try again, I had stars, baskets, bow ties, hearts and houses. I made the triangle-squares at the bottom, above, as a quickie row to take up space and to warm up a little. 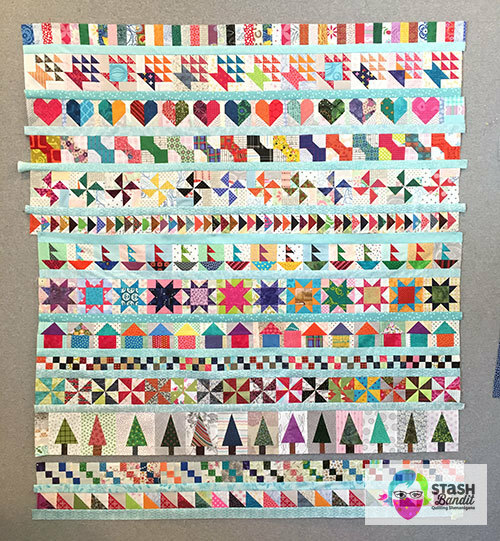 My friend Paula Stoddard made the quilt that QM published as Little Bitty Love in a newsstand-only special called Quiltmaker’s Row Quilts. I love her version, but I wanted to make it my own so I decided some creativity was in order. 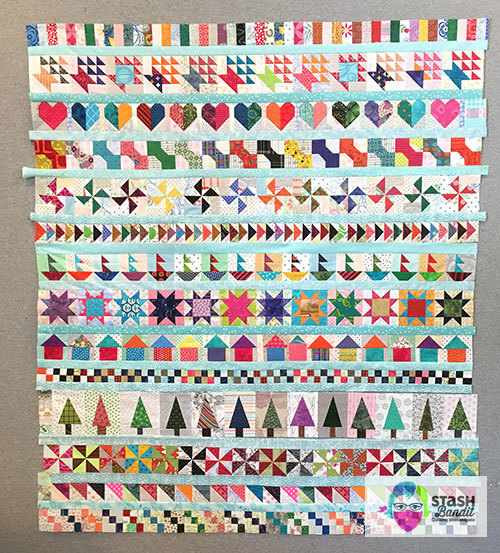 I made a bunch of Flying Geese, a checkerboard, Housetops (third row from the bottom), and bricks (fourth row from the bottom). I thought I had a pretty good handle on things, so I began sewing rows together. But when I looked again, everything felt very congested near the bottom. There wasn’t room to breathe. So much checkerboard going on and on and on. And the bottom row of Housetops just didn’t feel right. This is often the price you pay for veering off in your own direction. 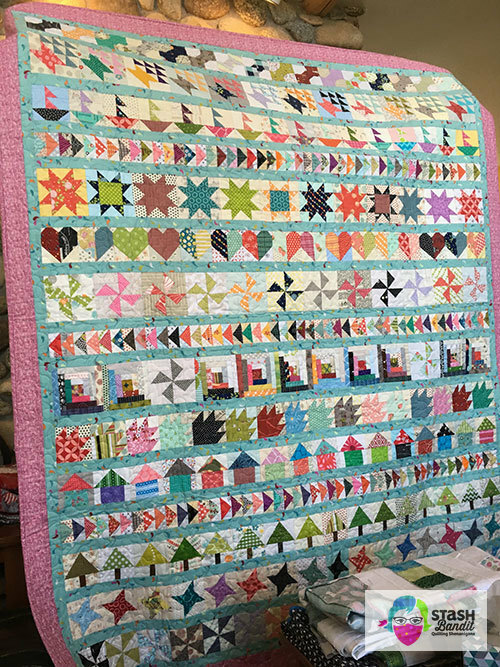 It’s always easier and quicker to make your quilt look just like the one in the pattern, but for me, it’s more satisfying to add my own twist. That’s why I do it, in spite of the extra headaches. 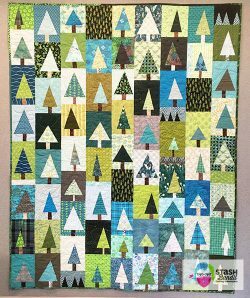 In order to give it room to breathe, I wanted more background, so I made some improvisational trees using Amy Smart’s tutorial at Diary of a Quilter. I cut my patches 5″ x 6″ but pared them down a lot in the end. They’re the only wonky row in the quilt, and I worried that they’d look out of place, but I think they’re okay in the end. As I stood back and looked again (always stand way back, across the room), something else was bothering me. I realized that the pinwheels would look a lot better below the trees than above them. More unsewing. Possibly bad words. Resewing. Good thing I was home alone! 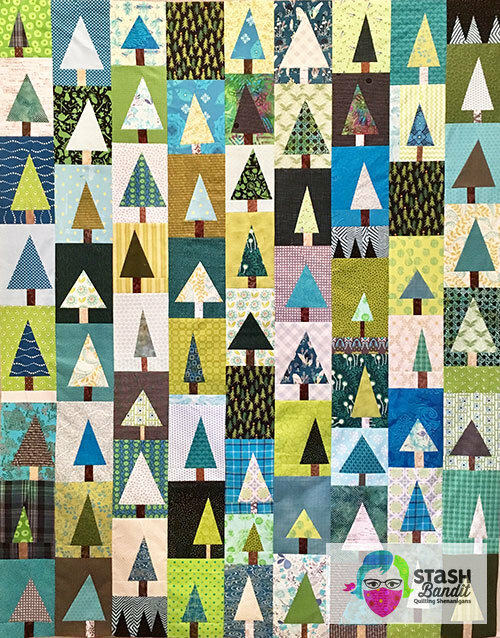 I moved the trees up and I switched the triangle-squares with the row I call Dribble. Now Dribble is at the bottom. I also eliminated the Housetops—they seemed way too heavy for the quilt. Now we’re getting somewhere. You can hardly see it here, but the horizontal aqua sashing is scrappy. 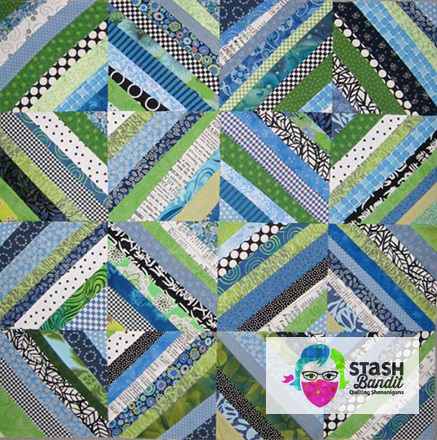 I only had small pieces of aqua: fat quarters or less. 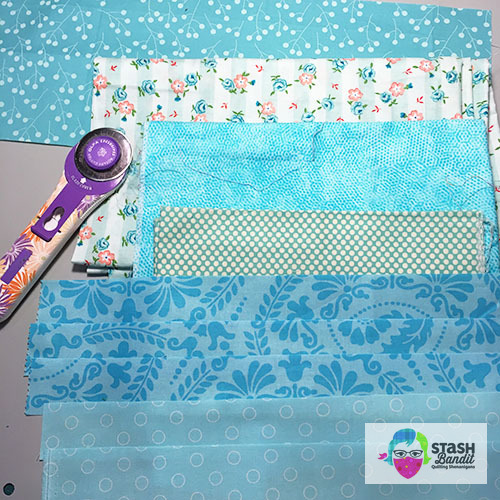 I wanted this to be stash sewing, so I found aqua prints that read about the same, pieced the length I needed and called it good. Some are brighter aqua prints but I used the back side—one of my favorite tricks! 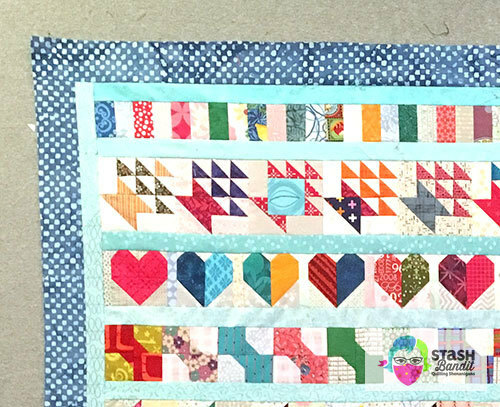 For the side borders, I used up the leftover aqua strips. I think it looks fine. I auditioned at least 10 fabrics for the final border. Nothing seemed to work. The idea is always to have something with interest that does not compete with the center. You don’t want to go to all that work in the middle only to have the border detract from it. 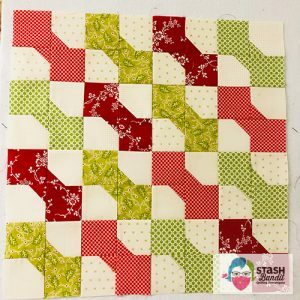 I think this border works, and I had it in my stash! Once it’s quilted, I may put a bright pink or red binding on it. It would be like an exclamation point! 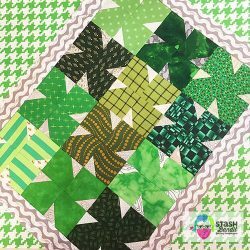 This quilt goes into my trunk show, “Make Extraordinary Scrap Quilts.” It gets great reviews and I think your guild would enjoy it! Get in touch today.